This Basic Life Support (BLS) class is the Required CPR for all school healthcare and medical related programs. Nursing, Dental, Medical, EMT, Therapists, etc. 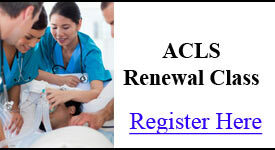 ACLS Renew. Advanced Cardiac Life Support Class, KY. 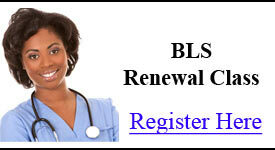 Renew Your ACLS Card Here! 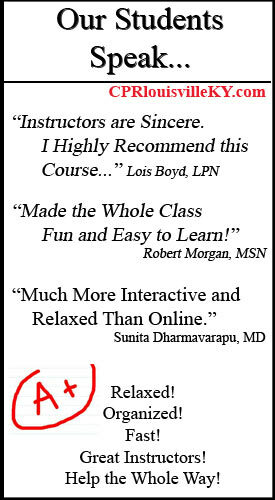 Refresh your Advanced Cardiac Life Support (ACLS) skills. Receive your 2 year ACLS provider card the same day as class. 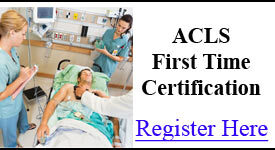 Register today for a Stress-Free ACLS course in the local Louisville area. Renew Your PALS Card Today! This AHA Stress-Free course allows you to refresh your Pediatric Advanced Life Support 2 Year Provider Card. All classes are taught by AHA certified PALS instructors in a relaxed, fun local Louisville KY classroom. American Heart Association Online CPR Classes. BLS, ACLS, PALS and HearSaver CPR and First Aid. 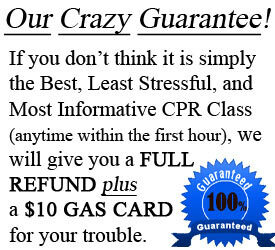 Get CPR certified in the comfort and convenience of your own office. BLS, ACLS and PALS classes. We bring everything to you! Call Now! 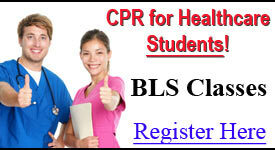 Register Here to renew your Basic Life Support (BLS) CPR for Healthcare Providers. Receive your American Heart Association 2 Year Provider Card immediately after class. Register Here to earn your American Heart Association Advanced Cardiac Life Support, ACLS, certification. Stress-Free and Relaxed! 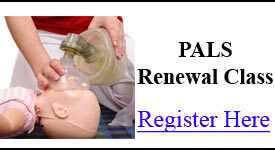 Earn your Pediatric Advanced Life Support certification. American Heart Association PALS courses are hands-on, relaxed and local. First Aid and CPR for the Public. American Heart Association First Aid and CPR class teaches you how to take emergency action for broken bones, sprains, strokes, bites, wound care, bleeding, sudden cardiac arrest, choking, etc. Register for an American Heart Association Skills Check to complete your Online CPR Course. 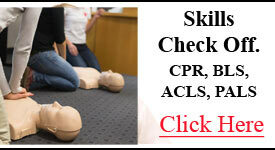 We offer Skills testing for BLS for Healthcare Providers, ACLS, PALS and HeartSaver First Aid and CPR. Q: Are you an American Heart Association Training Center? A: Yes. 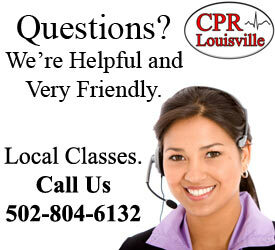 CPR Louisville is certified by the AHA to teach BLS, ACLS, PALS and HeartSaver CPR and First Aid Classes. Q: When do we receive our AHA Provider Cards? A: You will get your certified American Heart Association Wallet Card immediately after successful completion of the class. Q: How do we register for a class? A: You can register for any class securely online by clicking on the class of your choice in the calendar found on each page. You can also call us at 502-804-6132. Q: What courses do you offer for healthcare providers? A: For healthcare providers such as general physicians, emergency room doctors, nurses, dentists, all therapists, radiologists, surgeons, paramedics, emergency medical professionals, pharmacists, etc. 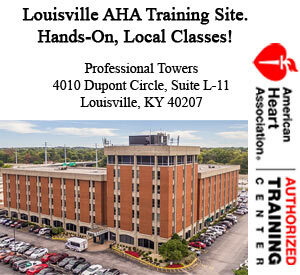 we offer Basic Life Support, Advanced Cardiac Life Support and Pediatric Advanced Life Support classes all in the local Louisville, KY.
Q: What type of CPR class is required for medical and healthcare related school programs such as medical school, dental school, and nursing school? A: The course that satisfies all basic CPR requirements for school programs is Basic Life Support. 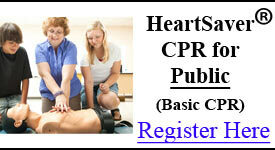 This course is also known as CPR for healthcare providers or BLS for healthcare providers. Often it is just referred to as BLS or BCLS. Q: Which CPR class is for the public, i.e. for people with no medical background? A: HeartSaver CPR is for the general public. This course is designed for teachers, coaches, life guards, parents, etc. Q: Do you teach First Aid classes? A: Yes. We teach HeartSaver First Aid which is designed for individuals with no medical background. Q: Do your CPR classes in Louisville include training on infants, children, adults? A: Yes. Our courses also include training on Automated External Defibrillators (AED's). Q: Is it possible to earn a CPR card from the American Heart Association entirely online. A: No! The AHA requires at the very minimum that everyone at least receives an in-person, hands-on skills check. Q: Other than Louisville, what other cities or areas do you serve? A: We serve all areas surrounding Louisville including, Saint Matthews, Newburg, Okolona, Highview, Lyndon, Shively, Fern Creek, Jeffersontown, Valley Station, Shelbyville, Radcliff, Graymoor-Devondale, Anchorage, Middletown, Northfield, Chickasaw, Beechmont, Cloverleaf, Frankfort, Lexington, Taylorsville, Shepherdsville Bardstown, Elizabethtown, Clarksville, Middletown, and Hurstbourne. We also provide training for students within Indiana in such areas as Jeffersonville, Clarksville, New Albany, and Oak Park. A: We accept all major credit cards including Visa, Mastercard, American Express and Discover. Register Now for a Basic Life Support (BLS, BCLS) class, Advanced Cardiac Life Support (ACLS) class, Pediatric Advanced Life Support (PALS) class, or HeartSaver CPR and HeartSaver First Aid class. All classes are American Heart Association (AHA) certified courses. Each Class is taught with a hands on and stress free approach. 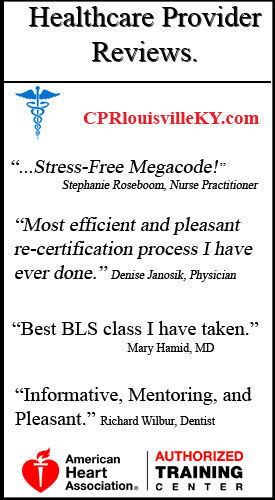 © 2019 CPR Louisville | BLS, ACLS, & PALS Classes | CPR Certification All rights reserved.